COPS talented open water trio. From the left they are Jamie Scholes, Kenzie Whyatt and Harry Whiteman. City of Peterborough Swimming Club (COPS) star Jamie Scholes is warming up nicely ahead of his big Team GB debut next month. 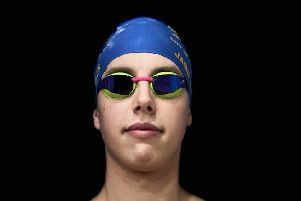 The 18 year-old all-round talent was last week selected to compete for Team GB in the 10k race at the European Junior Open Water Championships in Malta in July. At the weekend he swam the 5k distance at the Great East Swim meeting on Alton Water in Suffolk and stormed to victory in 59.18. Clubmate Harry Whiteman was eighth in 1.02.04 and Kenzie Whyatt was 18th overall and seventh female in 1.06.32. Scholes’ latest success came hot on the heels of another impressive win in the Best Fest Open Water Festival in Majorca when he finished first - by a considerable margin - out of an international field of 74 swimmers. He said: “Majorca was a great experience for me as it was my first time swimming in the sea and also my first time competing against international opponents. Hopefully that will give me a good feel for how the Europeans will play out next month. “The GB call-up was such a good feeling for me as it has been my goal for years and now I can finally start to move up the ladder again and aim for those big selections. Scholes, a former Jack Hunt School pupil, now trains full-time as part of the Team GB elite pathway. He has represented England four times in the pool. “But open water is such a different sport to pool swimming,” he added. “Every race you do is different and that’s why I enjoy it so much. “My long-term ambition is to make a senior international team which will hopefully put me in a good position to be considered for the 2020 Olympic team,” he said. 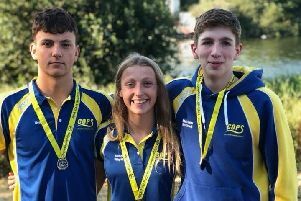 COPS head coach Ben Negus said: “The Great East Swim elite race involved the swimmers that have qualified for the European Junior Open Water Championships, plus some invited national swimmers that met a qualifying standard. Kenzie Whyatt (16) and Harry Whiteman (17) were invited and Jamie was an automatic invite. “Jamie will now go on to the European juniors on July 16 while Kenzie and Harry go on to the East Region Open Water Championships and then the National Open Water Championships on back-to-back weekends at the end of July. “For Kenzie and Harry it was their first open water race experience of the season and they will use this to prepare for the Nationals. “For Jamie it was a compulsory prep race before they fly out to Malta for the Euros.